The whole LVC-Audio plug-in catalog has just been updated in order to add new features and improvements. 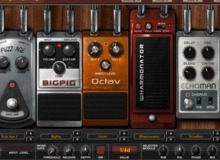 During the last days of Summer, SoundToys lowers the price of a selection of its plug-ins. Ace is the first “virtual” creation by boutique effect pedal manufacturer Shattered Glass Audio. Scuffham released an update for its S-Gear modeling amp plug-in, which is now in version 2.4. Amplion Pro 1.1 is the latest version of this amp-and-effects modeling software from Audiffex. Can it hold its own with stiff competition in the modeling software field? G-Sonique announces the release of Rock and Metal Boutique, a new VST plug-in for Windows that features guitar effects and amps. AudioAssault introduces a new collection of amplifier simulations, but for bass players this time. Pro Tools user can now discover the LVC-Audio plug-ins thanks to the addition of the AAX and RTAS versions.